This year I was fortunate enough to be able to attend the Museums and the Web conference for the second year running – my penance and reward was to present a paper: Mobile Bouleversement (yes I googled this word to have an interesting title and have no idea how to pronounce it – I managed to avoid saying it throughout the conference). You can read my pre-submitted paper on the Museums and the Web website, and you can read my thoughts on the rest of the conference here. In this post I thought I would share the talk I gave on the day in case it is of interest. Ashmolean Museum of Art and Archaeology – Founded in 1683, it may be the first public museum, certainly the first in the UK, and it has classical antiquities, eastern and western art, numismatics, and that type of thing. Museum of the History of Science – Early scientific instruments, eastern and western, including a particularly fine collection of Islamic scientific instruments. Museum of Natural History – Entomology, mineralogy, dinosaurs, Darwin specimens, the Dodo, and was the location of the great debate on evolution in 1860. Pitt Rivers Museum of Anthropology and World Archaeology – with historic displays showing objects by type rather than region – they were originally designed in this way to show evolution between cultures, but now aim to show different cultural responses to common human problems. They are all open free to the public and together the museums receive about 2-2.5 million physical visitors a year. As Partnership Officer I am one of a small team of half a dozen (from a staff of about 250) who work on joint projects and activities across the four museums, and my particular area is digital. Last year, pretty unexpectedly, we were offered significant funding by our local city council to install free public Wi-Fi across the four museums as part of a broader project to improve broadband and Wi-Fi access across the city. As well as being very welcome, it was a bit of a challenge. We sorted out the funding in September and had to deliver before the end of March. This might seem like a long time but we had to install over 100 new access points in the public spaces in our buildings, which are all Grade I listed. This basically means that every installation is bespoke. There were lots of challenges along the way, for example, when we ordered the WAPs, the standard mounts did not fit, despite being made for them. In the end our mount maker at the Ashmolean had to make the mounts from scratch. Actually he made a cool click and go mount that was much easier to use than the original mounts and actually helped. But anyway, that’s not what I am talking about, suffice to say it was a challenge. I’m pleased to say that we launched on 24 March. This is a example of one of our log in pages, the service is provided by WiFiSpark, and so far so good. Although a welcome boon, the public Wi-Fi project presented us with another challenge – how could visitors use the Wi-Fi to enhance their visit, how could we meet their expectations? With no Wi-Fi and no mobile coverage within our buildings, previously we had done very little in terms of developing digital content for in gallery visitors. Not only was this an opportunity for us to start thinking about providing this, but also a challenge as we also felt that we needed to have something in place for launch day to meet visitor expectations. We decided to develop some core content, as well as look at a few innovative opportunities. So looking at the core content, again we had the same short window to deliver. Eight months sounds like a long time, but it wasn’t because we were really constrained. For our core onsite offer, whatever that was going to be, we had £5k. We don’t have any developers within the museums, so that money was going to have to pay for developer time. Luckily being within the university we were able to call on colleagues in IT Services who had the expertise and we had worked with before so we could kind of hit the ground running. But of course that is just about 10 days of developer time, the really intensive part of developing this was going to be coming up with the content, and we didn’t have any capacity for that. Everyone is already working at full tilt, we didn’t have any money to backfill the people we needed, even if we could have managed that logistically, so everyone had to work on this off the side of the desk in addition to everything else. So for us, within that time scale, the only option for launch day was a minimum viable product. Also, before moving ahead, we had to spend quite a bit of time deciding whether we were going to go ahead with one platform, or four individual platforms, one for each museum. We installed a single Wi-Fi network because our network and firewall were designed that was as one of our first joint museums digital/IT projects. But that is not how any of our other digital infrastructure works. Each of the museums has their own brand and visual identity, which are reflected on their own completely independent websites, which run on completely different CMS, the museums have different collections management systems and different format online collections databases – there is very little connection between the museums in terms of our public facing digital offer. 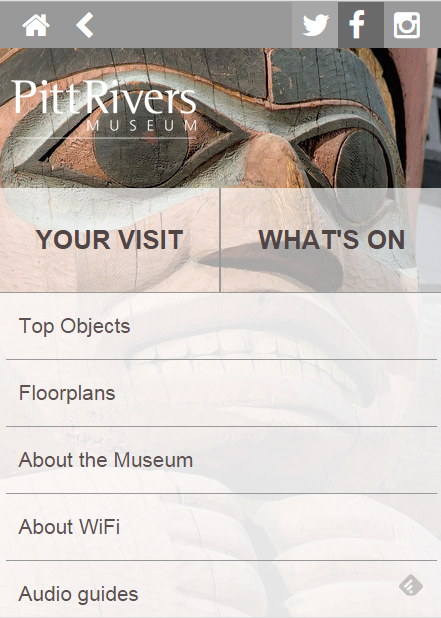 This was also a problem for the Wi-Fi infrastructure: although it is a single service and a single network, each museum has a different SSID and landing page. Agreeing the general design for the landing pages was not easy, understandably because we had to develop something that didn’t align with any individual brand, but worked with them all. In the end, after quite a bit of discussion of the pros and cons we decided that we were going to develop just one platform. This was firstly because our resource was small both in terms of money and time as well as expertise, but also it was an opportunity to try a more joined up approach. So we decided that we would build a joint museums mobile website – we decided on a site rather than an app as we didn’t want any barriers to people using it, as 35-40% of our visitors are international tourists, another 30% are UK tourists, not locals, so unless it was a really amazing app, we didn’t really think that people would be willing to download it for just one visit. Also with a mobile site we could just push people straight to the site after they log on to the WiFi, which is obviously very important to make it discoverable. We did do a very quick and dirty visitor survey asking people what they think they would use the WiFi for at the start of the project. The majority of people said that if they were looking for more information about the collections, they would google it rather than go to our website and try and navigate from there, so really important to make sure that they are aware of the resource, so they log in, see the website, shut it down and go to social media or their email, but when they did want to access something about the collections rather than going straight to google, they might think to come back to that resource. The survey also told us that 90% of our visitors carry mobile phones rather than tablets, making us confident for designing for small screen first, also 50/50 iOS and Android, which again put us off the app since Android users are less likely to download an app and the expense of needing to develop both. We didn’t get as much out of the surveying as we would have liked, not only because it is hard to ask people to respond on the theoretical, but with very little experience under our belt, we didn’t really know what questions to ask. So in that way, only being able to afford a minimal viable product was a blessing. As you know, when you invest a lot of money in something you feel like you need to maintain it and work with it because of your investment, but because it was a small amount of money we have been able to say that this is a pilot based on what we know now, and we are going to learn so much from what people actually do, and conducting research with real products, we may decide that we want to scrap it and start again, and that will be OK. Anyway, as well as this surveying, we did a lot of desk research looking at the mobile sites and apps of other museums. Not only did this help us think what content to push specifically to onsite visitors, but also helped us hone our ideas on the design and keeping clean. 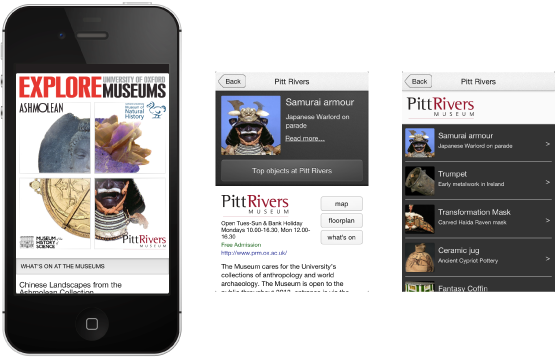 We had previously done an app (an app so that it could be downloaded before entering he building and still work with no signal) based on a successful print marketing campaign: Explore Oxford University Museums. The app was based on the campaign visually and also in terms of its purpose. 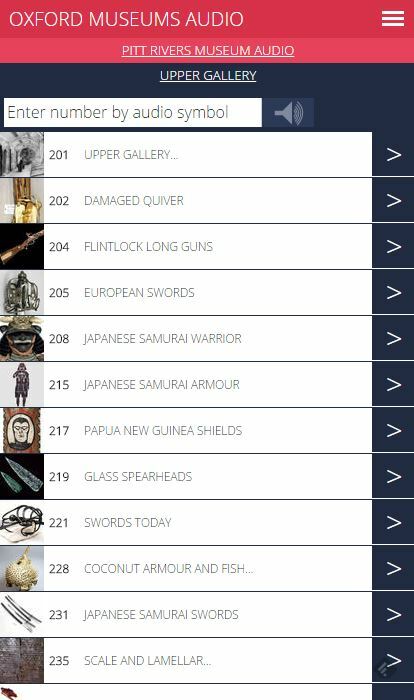 It just lists and locates 10 highlight objects in each museum giving a bit more text based info, and the message was the same, you have seen the highlights in this museum, can we tempt you with another. So we toyed with the idea of using the same theme for our website, but we backed away from that really quickly as it is really busy, the visuals aren’t really working on the small screen, and it was the sleek and simple menus that we saw on the other sites that worked. So we went with a really simple menu and navigation, and then like with the sign in page went with a different background image to distinguish the museums. 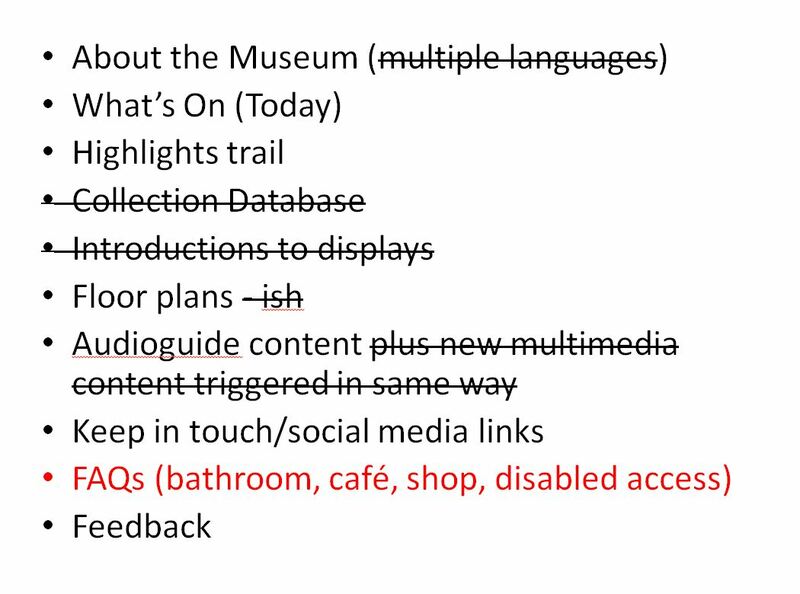 Then we came up with a list of the content that we thought visitors in the museums would need, and that we thought we could come up with in the time. So as you can see, this is what we thought was the minimum viable product, but we weren’t able to deliver them all. We stepped back from delivering introductory information about the museums in multiple languages. We have this information in print form at all the museums, but they aren’t in the same languages for each museum, and it wasn’t the cut down information that we would use for the website, it was the long welcome. And since we were not going to do everything in multiple languages we weren’t adding any additional value, so we decided to stick to the welcome print outs in other languages that we provide. 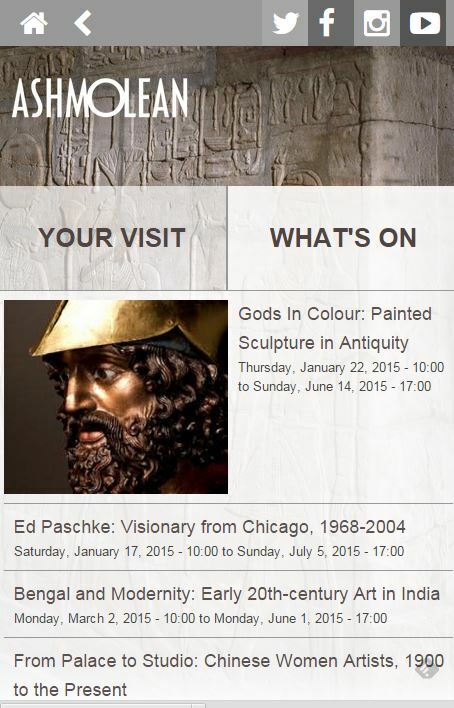 Of course what’s happening at this museum (and other museums nearby) during your visit seemed like a key piece of information, so we set up the site to automatically abstract events and exhibitions information from the individual museum events listings. We wanted to include a highlights trail for visitors who only had a short time in the museum. It was also easy content to deliver since the app I mentioned previously already contains this content, and has a CMS to allow us to update this as desired. So the mobile website pulls this information directly from the app for consistency, and so the information only needs to be updated in one place. Of course we thought it would be great if we could give access to the collections database. But we weren’t going to be able to do this for all the museums, as not all of their databases currently work that way. But actually that wasn’t the main problem – even when we were working with a collections database that spat out html5, we didn’t really know how we would make it navigable. You would have to go in and look up the object in front of you under things like keywords, which wouldn’t be intuitive, or know about the inventory number, it seemed like it would not be a positive experience for visitors. 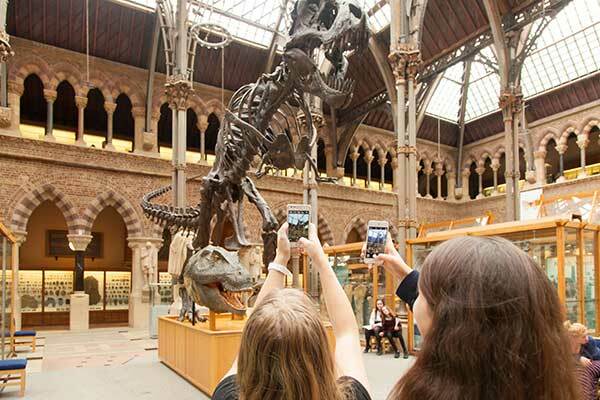 At the Pitt Rivers Museum where the database does interact well with mobile devices, and they also have fantastic proactive front of house staff who actively engage visitors in discussion about the collections, we intend to equip staff with iPads (and a bit of additional training on the database) so at least they can access the records while engaging with the public. This may also reveal how useful this facility would be. Our surveying indicated that a lot of people would prefer general intros to displays rather than individual object information. This is a welcome opportunity, as our displays are object heavy and interpretation light, especially at the splay level, but again the key problem was actually how we could effectively direct the visitor to the right information for the display they are looking at. SO this is something we are still considering. Floorplans was an ‘ish’, because although our mobile resource includes floorplans, they aren’t what we wanted. We are just providing jpegs of our print floor plans, optimised a bit to look better on mobile, but they aren’t great. Also, while we can insert pins onto the map to show where things are (and we do this with our highlight objects) it doesn’t know where the user is. So although we are currently providing floorplans, there is a lot of work still to be done there. With audioguides we had a head start as we had already done a project to build a mobile website to host our audioguide content. It was simple because the audio stops in the museum are already signed, so you navigate to the number and play the sound, which is hosted on SoundCloud. It looks different to the rest of the mobile website because it is a different site, so when you select it you are told that you are being taken to another site and you confirm that you are happy with that. We wanted to add more multimedia content to this, some of which has already been developed. 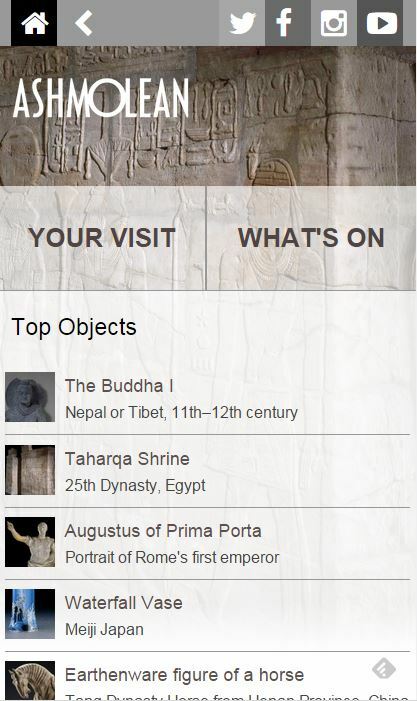 The barrier was the physical numbering in the museum, it is easy to add new multimedia content to the audioguide site. But this is something we can do gradually over time now. Of course our survey also revealed that only about 25% of our visitors always carry headphones, so perhaps there is a market there for museum branded headphones. This bit is underlined because they got a bit out of hand. What was meant to be a few key things for visitors has got out of control as a bit of a catch all and a place where all departments can place their content. But this is something we can work on over time, as it is a Drupal based website with a really simple CMS, so we can play with this as we see what users do and make it a better fit. Also, as you will have seen throughout, wherever possible we have pulled content from where it is already published, so we aren’t duplicating effort or tying ourselves heavily to this new product. It has only been 2 weeks so unfortunately we don’t really have any usage insights yet. I did want to say something about the Innovation that we have been doing alongside developing this minimum viable product, but there is no time – it is in the article published on our website if you are interested. So I won’t say anything about the individual projects that we have come up with, but I did want to quickly say something about how we enable that since it has been really successful for us. For the last 2-3 years we have ring-fenced £20-30k from our budget for what we call the Innovation Fund. Colleagues from across the museums can apply to this for £500-£5,000 through a competitive process for activity that looks at innovative ways of working or engaging audiences. We kick of the fund each year with a workshop with colleagues from places like the Said Business School and Skoll Centre for Social Entrepreneurship. We find that people really do innovate. The application process is light touch so that isn’t a barrier, and they do have permission to fail, since it is outside their core budget and deliverables, and it isn’t an external funder, who no matter what they say you don’t want to go back to and say you failed. And although it is rarely enough to pay for staff time (and the time involved would be too msall to backfill), so people have to do the work off the side of the desk, it is things they really want to do, so they find the time. We had a lot of success across the board with this, so do check it out online. Stealing our idea, maybe, the University of Oxford introduced their own IT innovation fund this year, but with significantly more money on the table. We have actually just received £50k for them for a project called Hidden Museum. It is basically the phase 2 research stage for our mobile offer. They have given us the money to develop and evaluate a series of prototypes to test different methods of context specific content delivery, looking at both editorial and triggering. We are still at the early stages, figuring out what areas we want to research and want prototypes we want to develop and test. I’ve already gathered some great ideas here so watch this space. This entry was posted on April 26, 2015 by Jessica Suess in Museums.